Upcoming beer events in Las Vegas: EarlyVegas lists the best Las Vegas events for beer drinkers during spring and summer 2013. The Pub at the Las Vegas Monte Carlo hotel is throwing a monthly beer pairing event in Las Vegas called Gus’ Beer and Bites. Kicking off the monthly Vegas events at The Pub is the Left Coast Brewing Company on Wednesday, April 24th at 6:30 pm. This monthly Vegas event features dinner paired with beers from top breweries, and the first event from Left Coast Brewing Company will start with it’s Una Mas seasonal spring beer. The beer pairing events will take place in the upstairs dining room at The Pub and include appetizers and samples of craft beer. 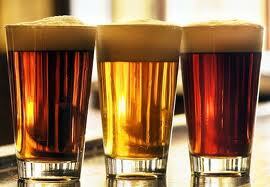 A brewery representative will host the event and explain the pairings and flavors. These beer pairing events in Las Vegas at The Pub for Gus’ Beer and Bites are scheduled to take place once per month through December 11th, 2013. Other dates for Gus’ Beer and Bites events this summer in Las Vegas include New Belgium Brewing Company on June 26th and Boston Beer Company on August 28th. The Lagunitas Brewing Company and Fleur by Hubert Keller at the Mandalay Bay Las Vegas hotel will be hosting a beer pairing dinner on Friday, April 26th. The dinner and beer pairing event at Fleur by Hubert Keller in the Mandalay Bay Las Vegas begins at 7:00 pm and includes a five course prix fixe menu. Both Ron Lindenbusch, the Lagunitas Head of Marketing, and Sarah Johnson, the Mandalay Bay Director of Food & Beverage and the first female cicerone of Nevada, will be leading the event and guiding guests through the pairing and dinner. Contact Fleur by Hubert Keller for more information and to make a reservation. Returning for its 3rd year in Las Vegas, the Great Vegas Festival of Beer is back for its 2013 Vegas event on Saturday, April 27th. The Vegas event takes place in Sunset Park at the Events Pavillion: 2601 E. Sunset Road, Las Vegas. While the Early Entry Beer Tasting and the Brewers Lounge VIP tickets are already sold out, the Beer Tasting tickets (general admission) are still available online and at Las Vegas Whole Foods stores. Buy them presale for $30, or for $40 at the event! The Beer Tasting Las Vegas ticket for the Great Vegas Festival of Beer includes a free ride to the event, a 5 ounce GVFB tasting cup, and unlimited samples of over two hundred craft beers. Plus, this Vegas festival also includes live music all day and tasty food for sale from local vendors and restaurants. Back for its 4th annual event, Brews & Blues Festival in Las Vegas takes place on Saturday, June 1st from 4:00 pm to 8:00 pm at the Springs Amphitheater. This fun Las Vegas summer event features beer from international, domestic, regional and local brewers. It highlights beer from the Springs Preserve, which is a national historic site 3 miles from the Las Vegas strip. Knock back some brews, enjoy the Vegas food vendors, and jam the night away to the live music at this summer Las Vegas event. Tickets go on sale April 29th, and general admission tickets cost $36/person pre-sale or $40/person if bought the day of the event. For $75, enjoy VIP access to the climate controlled brewers lounge. The Las Vegas beer pong tournament at the Las Vegas Hard Rock Hotel & Casino called The Masters of Beer Pong 100K Tournament will take place from July 1st to July 3rd, 2013. Put together by BPONG, this Las Vegas beer pong tournament is the biggest beer pong tournament in Las Vegas held to date. The Vegas event takes place at The Joint within the Hard Rock Hotel & Casino and will be featured at the parties at Body English Nightclub & Afterhours and Rehab. Visit the event page for this Las Vegas beer pong tournament for more information. This article was written by Ariel Abbott, Editor of EarlyVegas.com. EarlyVegas.com is an authority on how to save money and get the best value when planning travel to Las Vegas. EarlyVegas.com searches the web for the best packages, specials, promotions, deals, and promo code offers that help travelers save and get the most value when booking hotel rooms, tours, and shows in Las Vegas.